As a collector, I have obtained rare early CD pressings of my favorite albums across many genres. However, collecting also has exposed me to new music, some I had heard of and some previously unknown. In this post, we show an example of new music (new to me) in the latter category. The band is Decameron. Kudos if you had heard of them before reading this post. That is not intended to be a slight of the band. Rather, it is a simple acknowledgement of their obscure status. Decameron were a folk rock band out of the U.K., forming in 1968. Founding members were Johnny Coppin (guitar, piano, and vocals) and Dave Bell (guitar, percussion, and vocals). Additional members joined in 1969, and the band grew further in the next few years. 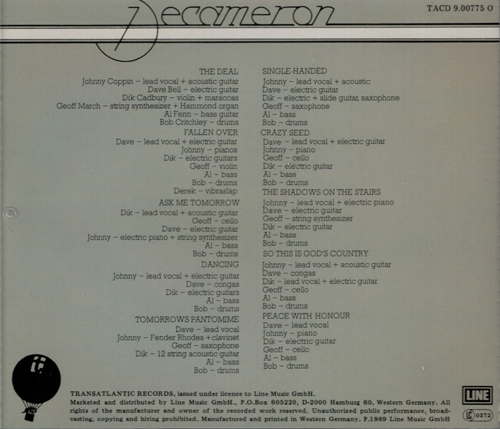 Between 1973 and 1976, Decameron released five studio albums. Here, we consider their final release, Tomorrow’s Pantomime. 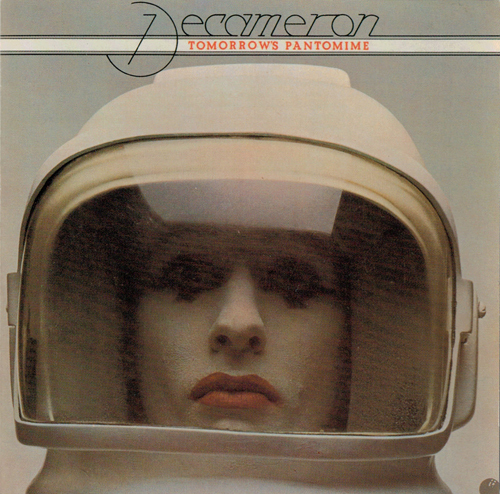 Tomorrow’s Pantomime was released in 1976 by Transatlanic Records. 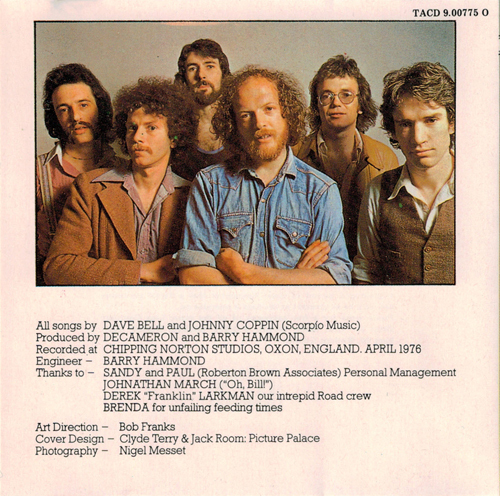 Coppin and Bell are joined by Dik Cadbury, Geoff March, Al Fenn, and Bob Critchley on the album. The album cover is odd, though it follows the album title, showing a mime wearing a space helmet. The album contains 10 songs, all written by Coppin and Bell. The original CD of Tomorrow’s Pantomime was released in 1989 by Translatlanic in conjuction with German label Line Records. The catalog number for the disc is TACD 9.00775. The disc was pressed by the P+O plant in Diepholz, West Germany. P+O was and still is part of the Pallas Group and continues to press CDs in Diepholz. 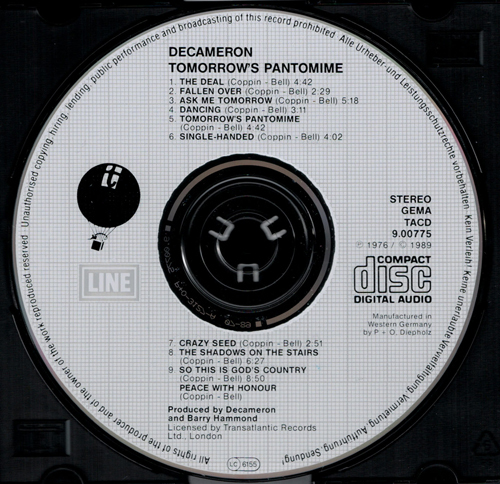 The label design of the Tomorrow’s Pantomime disc is unique, though typical of Line CDs. The disc has black text over white “graph paper”. It has a clear plastic ring at the center, and the matrix code is “9.00775 P+O-3127-A 07-89”. “07-89” suggests that the glass master to press this disc was produced in July of 1989. The disc shows a Phonogram date of 1976, the year the album was first issued, and a copyright date of 1989. The disc also states “Manufactured in Western Germany by P + O, Diepholz”. Like the disc, the inserts state Western Germany instead of West Germany. Shown below are the front and back covers of the Tomorrow’s Pantomime booklet, the back insert, and the West German pressing. The cover for the West German pressing of Decameron Tomorrow’s Pantomime (Translatlantic/Line catalog number TACD 9.00775). This is the standard cover artwork for this album. The back cover of the booklet for the West German pressing of Decameron Tomorrow’s Pantomime (Translatlantic/Line catalog number TACD 9.00775). The six-member lineup of Decameron is shown. Note the catalog number printed in the top right corner. The back insert for the West German pressing of Decameron Tomorrow’s Pantomime (Translatlantic/Line catalog number TACD 9.00775). There is no barcode. The catalog number is printed in the top right corner. The insert states “Manufactured and printed in Western Germany” along the bottom. The West German pressing of Decameron Tomorrow’s Pantomime (Translatlantic/Line catalog number TACD 9.00775). The “graph paper” label design is typical of CDs released by Line Records. The catalog number is shown at 3 o’clock, and a copyright date of 1989 is printed below the catalog number. The disc states “Manufactured in Western Germany by P + O, Diepholz” below the CD format logo. The matrix code is “9.00775 P+O-3127-A 07-89”.